Fabio Massimo Mastrangelo was born on November 27, 1965 in Bari, Italy into a musical family. He began piano studies with his father at the age of five. Fabio Mastrangelo is commonly referred to as Russia’s most famous Italian-born conductor. Currently, he holds a number of positions including those of Principal Conductor and Music Director of the “St. 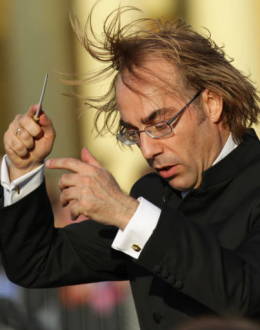 Petersburg Camerata” State Hermitage Orchestra, Artistic Director of the Novosibirsk Camerata, Principal Guest Conductor of the Novosibirsk Symphony Orchestra and a regular guest conductor at the Mariinsky Theatre and the St. Petersburg State Theatre of Musical Comedy. Fabio Mastrangelo is commonly referred to as Russia’s most famous Italian-born conductor. Fabio Massimo Mastrangelo delights audiences with the parallels between a symphony orchestra and a business team. He is founder and Music Director of Virtuosi di Toronto, a pool of professional musicians who have achieved individual recognition as orchestral players, chamber instrumentalists, and soloists. While bringing to their group a diversity of musical experiences, they have elected to their goal artistic excellence through the creation of an environment of mutual respect and cooperation.